They don’t call them “thrill rides” for nothing. The screams reverberating on amusement park midways are generated by the thrills that passengers experience as they hurtle along at bone-crushing speeds on roller coasters. Today’s mechanical behemoths are faster, taller, crazier – and just plain more thrilling – than their predecessors. 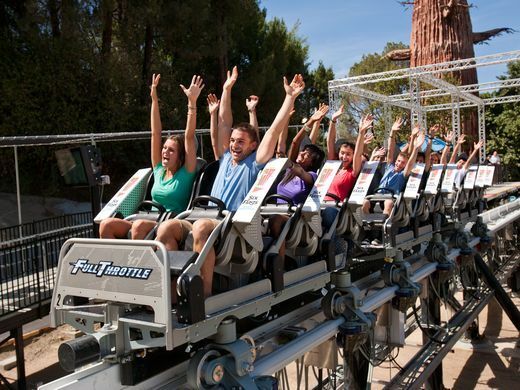 Full Throttle at Six Flags Magic Mountain in California. This coaster will throw you for a loop – and at 160 feet, it is the world’s tallest. 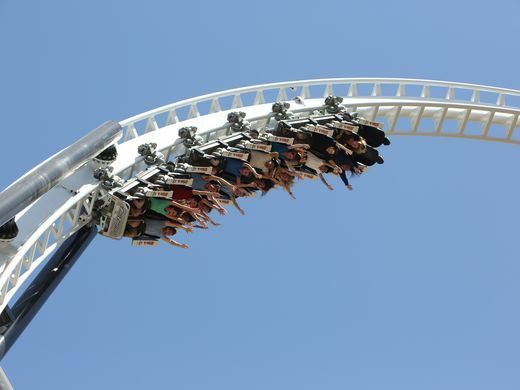 Using electromagnetic motors, Full Throttle screams out of the station, hits a full-throated 70 mph in no time flat, and immediately sends passengers racing around its crazy-tall inverting loop. It comes to a halt in a tunnel, launches backwards, then rockets forwards and soars – right side up this time – on the outside of the loop.